The continued snow drought is keeping me in the higher elevations. That said – the snow is still great up there! This week’s ski is a winter variation on one of my running posts from last summer, the Sugar Hill Reservoir run. Start this ski tour in the Brooks Road parking lot,which is found about a quarter mile from Rt. 125 just east of The Rikert Ski touring area. This parking lot is a popular starting point for skiers, snowshoers, and snowmobilers. I have also found that it is a great place to ski in low snow conditions, like this year, or early in the season before the first serious snow dumpings hit. 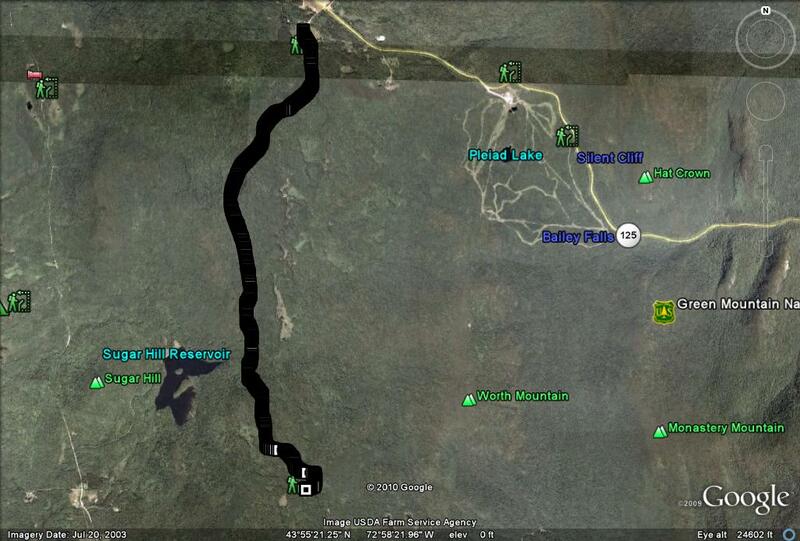 Once again, some of the best skiing is on snowmobile trails this season, and since the lower 2/3 of the Brooks Rd. climb is groomed for and by snowmobiles, this is where I started! The first hundred yards or so were pretty rocky, so I made a mental note to make sure I was not going too fast at the end of the descent (a little literary foreshadowing there) so that I wouldn’t get hurt. The snow coverage got a lot better as soon as the climbing started, however, except for a few short stretches where overhanging pine trees diminished the ground snow cover. These few minor problems aside, it was a steady easy climb on skating skis due to the fast, granular snow which has seen a few freeze-thaw cycles and just enough traffic to keep it from icing up. I knew the lowest 2/3 of the road would be fine, as this section is almost always well groomed for snowmobilers, and had planned on turning off the road towards the Sugar Hill Reservoir – following the route of my aforementioned summer run. I was pleasantly surprised, however, to see that the upper reaches of Brooks Rd. had been groomed for skiing for the first time in my recent memory. I presume our friends at Blueberry Hill have run their super-duper ski groomer Pisten Bully over this section at some point in the not too distant past, as this stretch is not open to winter motor sports. After about another mile of easy climbing, there was a slight descent to the end of the road. Given that it had been a few years since I last ventured up here in winter or summer, I was a little bit surprised to see the road end prematurely, but I followed the less impeccably groomed trail beyond this point. I quickly saw why the road had ended – apparently the old bridge up here had washed out at some point, and it was replaced by a nice little footbridge. I am not sure when exactly this went in, but I suspect that it was another of the fixes necessitated by the massive thunderstorms which wreaked havoc on Hancock, Ripton and East Middlebury in August 2008. 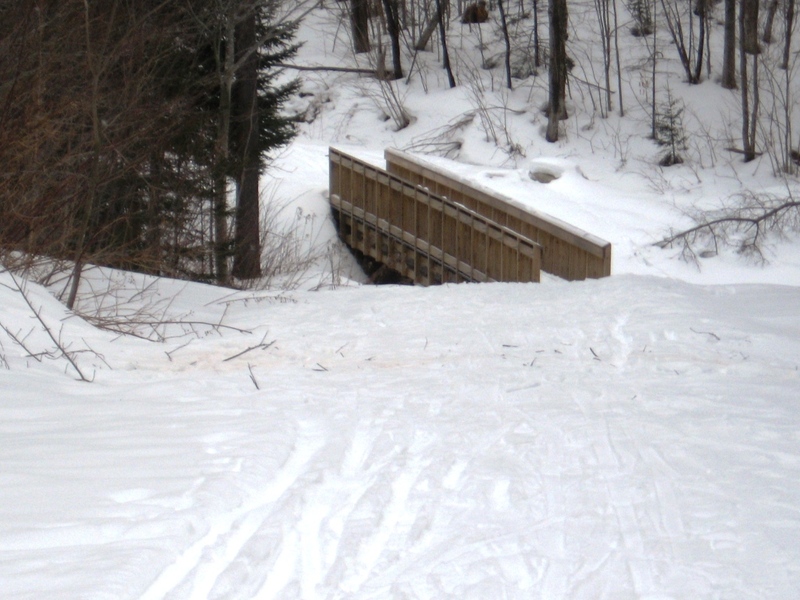 Immediately past the new bridge, the remnants of the old road funnel into a true trail, marking the entry into the Blueberry Hill Ski Touring Area, so continuation beyond this point leaves you morally and fiscally obligated to drop by the touring center and pay for use of their well-kept trails. I have no objection to paying their very fair fee, but since I really didn’t have time to make full use of their trails, I chose to turn around and return to my car. The return was fast and easy, and with the steady, but not too steep descent I thought I would use my GPS to see how fast I could get going. The very lowest sections are the steepest, so this provided to opportunity to check my pace. While my speed was not at all alarming, I wanted to see if I could at least break 20 miles per hour, so was skiing with my eyes on my wrist rather than the trail. Just a little faster……A moment after I saw my speed break 20, (21 mph to be exact), I looked up and saw a small bare patch in the snow which was too late to avoid! Note to self – old granular snow makes for easy gliding, while old granular dirt does not. While my skis put on the brakes, the momentum of my body kept the rest of me traveling along briskly, with the expected result. Ouch! Fortunately, the worst bruises were to my ego as I got up, dusted off, and returned to my waiting car a short distance away. This ski trip is 12 km (about 7.5 miles) round trip with about a 750 ft climb and descent. Great accounting of a fabulous trail. Your website is so much fun. The only thing that is missing are photos of the handsome author.